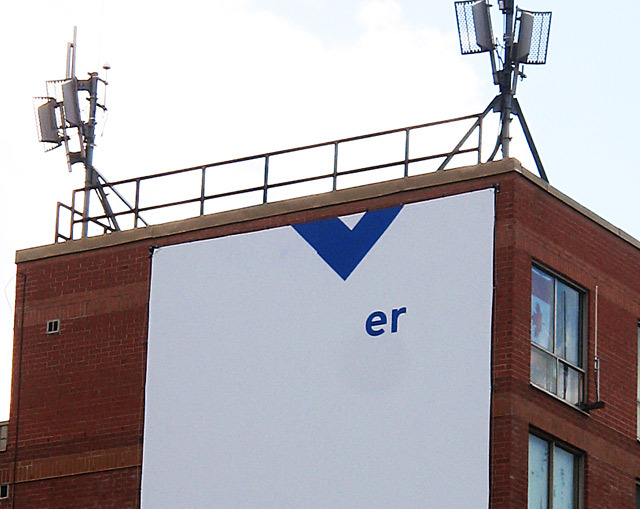 The latest ubiquitous mystery ad is “er.” Though it has various configurations—billboards, (illegal) signs, and subway station placards—it always takes the same rough form: two blue letters in the same typeface, and some lone blue shape on the edge of an otherwise white canvas. It’s no Obay as far as provocativeness goes, but it’s nonetheless drumming up more than its fair share of interest. So, who’s behind it all? Our money’s on Bell. The “er” ads were first spotted a few days ago, just as Bell took out full-page newspaper ads announcing the retirement of “spokescritters” Frank and Gordon, the anthropomorphic faces of the company’s publicity campaigns since 2005. Bell is also an official sponsor of the Olympics, which begin later this week and whose well-known Anglicized motto is the heavy-on-the-ers “faster, higher, stronger.” A multi-stage national ad campaign of this size also takes deep pockets, which Bell has. And besides, stunts like this are right up their alley: Bell was behind those wrapped present ads a few Christmases back, which were also in the company colours of blue and white. We e-mailed Pierre Leclerc, Bell’s Montréal-based Director of Media Relations (the French Prince of Bell Er, if you will) and asked if he could confirm or deny that his company was behind the ads. He replied: “Last week we announced that after almost three years, Frank and Gordon our popular spokesbeavers will no longer be used for our marketing campaign. On what’s next I can’t tell you but it will come soon.” Coy! The non-denial plus tease is the same strategy that Colleges Ontario first used when we were looking into the Obay campaign, and it seems like a pretty safe bet that the next phase of the “er” ads will be rolled out, by Bell, beginning later this week. 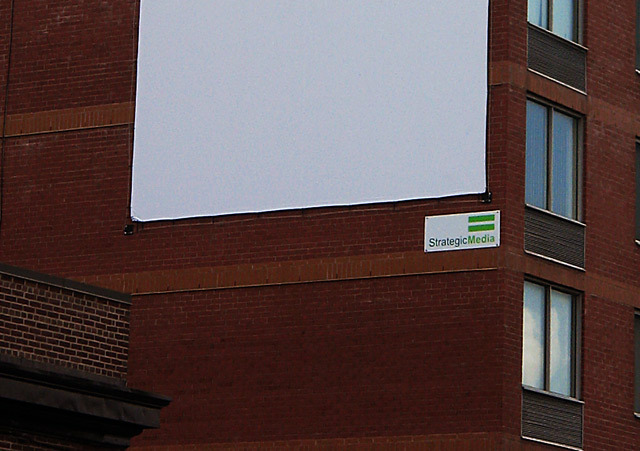 We just hope that companies considering a mystery ad campaign do a little better than a suffix next time. Thanks to reader Jason Wager for the tip and pointing us in the right direction. Photo by asianz from the Torontoist Flickr Pool.